If you read our newsletters regularly, you may have noticed that we didn't send one in April. We seem to be getting busier and busier, for which we are grateful, but time passes so quickly that all of a sudden, the entire month has passed and it's time to do following month's newsletter. We didn't want May to go by without saying hello. It was nice to see familiar faces at the Mounts Botanical Garden Spring Plant Sale and to introduce ourselves to new faces. Unlike last year, the weather cooperated beautifully so traffic was consistent. 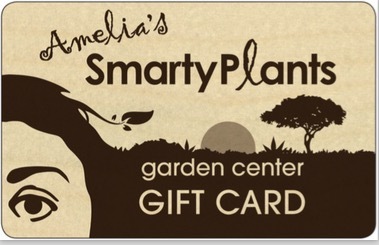 A few more people know about SmartyPlants now, and we hope the word keeps spreading. So many of you have been asking for Milkweed, also known as Butterflyweed, and we've had to turn you away because we couldn't get any that wasn't sprayed. But we found it, and we ordered many plants. Come and get it; we have plenty in stock for you to feed your babies. If you have always wanted a Date Palm, this is your chance to get one. We have Canary Island Date Palms and Sylvester Palms demonstrating great color. They are fat, healthy, and beautiful. 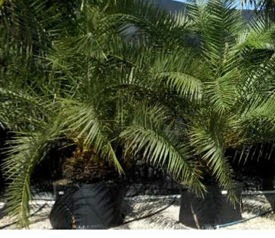 Make a statement in your garden, entrance, or pool area with one of these ready-to-go palms. Ornamental grasses always give me the sense of being at the beach. How lucky we are! But there are so many more choices when it comes to ornamental grasses than the ones we often see in landscapes. 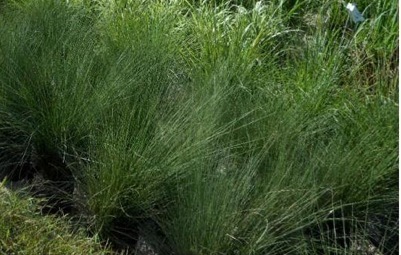 We currently have a very nice selection of ornamental grasses including Red and White Fountain, Muhly, Fakahatchee and Dwarf Fakahatchee, Bamboo Muhly, Cord, Love, Maiden (both green and variegated), Pampas, Pohgy-Dwarf Bamboo, Princess Caroline, and Panic Grasses. I think that's it, but there may be one or two more out there. They can be used in a grouping of the same variety, or they can be mixed to achieve more contrast in movement, texture and color. Pampas grass, reaching nearly 7 ft. tall, can contrast beautifully with the Love Grass which tops at 2 ft. Experiment with a few less common varieties and create a sense of being at the beach with your own grass medley! We are so happy to see a spike in interest in native plants - yeah!! 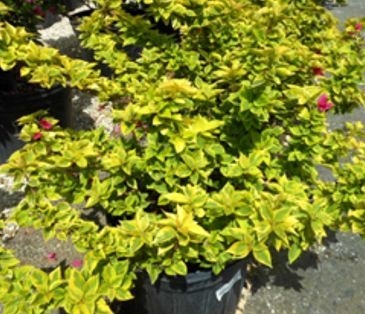 May's Plant of the Month is a Florida native that is a great performer and stands tall against other hedge plant material - the Maidenbush, Savia bahamensis (see pictures above). It belongs to the Euphorbia family, so it is inherently tough and withstands drought conditions once established. It can reach heights of 10 ft. but can be maintained at 5-6 ft. if desired. 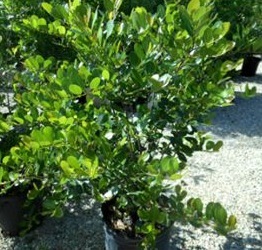 Most people would be convinced that it is Cocoplum because its growth habit and leaf shape and color are quite similar to the Cocoplum's. Tiny flowers develop on the branches which are a great source of nectar for pollinators. Think outside the box and consider Maidenbush for your next hedge or screening plant material or as a unique stand-alone bush in your garden. See it at SmartyPlants in 3-gal. and in 7-gal. sizes. It is hard not to love the Bougainvillea when it is in full bloom, but many of us don't even want to touch them for fear of being "thorned". They are prickly fellas. So what if we offered you a bougainvillea that was a prolific bloomer without the thorns? It's the famous Pixie. We have the green and variegated varieties. Their growth habit and structure is more lateral than vertical so they don't get quite as tall as the more common Bougainvillea variety. They are a great choice for a sunny dry spot in your garden that needs color. Our 7-gal. bushes are 20% off this month. The Green Buttonwood is hard to beat if you want a large hedge quickly. It is a Florida native that is drought tolerant once established, and it's a fast grower that performs best if grown to 8 ft. or taller. Our 3-gal. plants are 15% off this month. They will plant at 36-40" (!) and make an instant hedge. If you missed feeding your plants in March, do it now. 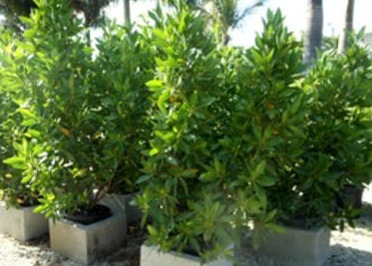 Please use a slow-release fertilizer and apply rates as specified on the bag for the plant/tree you are fertilizing. Water in well or let Mother Nature help you by applying the fertilizer prior to a rainfall event. IMPORTANT - Be sure to move the mulch out of the way and apply the fertilizer directly on the ground, then replace the mulch on top of the fertilizer. Why do we recommend this? Because mulch "eats" some of the nitrogen that's in the fertilizer reducing the amount that reaches your plants. If the rainfall event is significant, it can wash off some of the fertilizer prills. If so, you just lost your investment, your plants will go hungry, and the fertilizer that ended up in the run-off may reach a surface-water body increasing its nutrient loading. Instead, let's keep the fertilizer on the property and feed the plants. This is the perfect time to hard prune your woody ornamentals to control their size or to get rid of bugs. It's perfectly safe to cut back 1/2 to 2/3 of a plant. This will only promote new healthy growth. If the heavy rains continue, be vigilant of fungus. Moisture and warmth are the perfect combination for fungi to breed and settle in. If you catch it early, trim the plant to remove the infected areas. Otherwise use a fungicide to treat it. A good practice to prevent or minimize fungus on your plants is to keep air circulating in your garden, e.g., trim your plants so there is space inside each plant and between plants. Although the watering restrictions have been lifted, it is in your pocket's and in your plants' best interest to make sure your rain sensor in your irrigation system is working properly. This device is generally inexpensive and easy to install. If you don't have a rain sensor, turn off your irrigation system until we've had 4-5 days of dry weather or you notice that your plants are thirsty. It's okay for them to show a little thirst at the end of the day, but you don't want them to be wilted in the morning.